A few months ago we read and rated Princesses don't wear glasses. 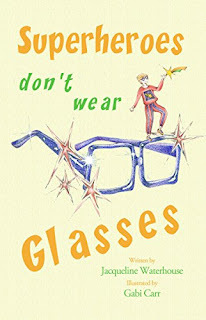 Superheroes don't wear glasses is a new book in the series, and it is also addressed to kids who are going through their usually hard first days wearing glasses. Alfie knows he needs to wear glasses. He has chosen a very cool pair, blue with silver sea creatures. But he still doesn't want to wear them. None of his friends wear glasses, and even most important, superheroes don't wear them. This changes when Alfie receives the visit of Jason, a pixie boy from the Land of Power, who leads him to an unforgettable adventure. Alfie not only will discover many things he was missing because of his short sight, but he will also meet Superhero Spectacus, the most coolest, strongest and powerful superhero who, of course, wears glasses. This book will talk to kids (not only boys) interested in superheros, and avid for look like one of them. The story will help to talk about the concerns a kid might have about wearing glasses, and ease the experience giving a different look on it.